Looking through a sculpture at Square Victoria in Montreal, Quebec, the fountain, people scattered around the square and a tall building make up this picture. People come and go through Square Victoria catching the Montreal Metro, while others enjoy lunch while listening to the water trickle into the fountain. >Sculpture and water feature in Square Victoria, Quartier International, city of Montreal, Quebec, Canada. 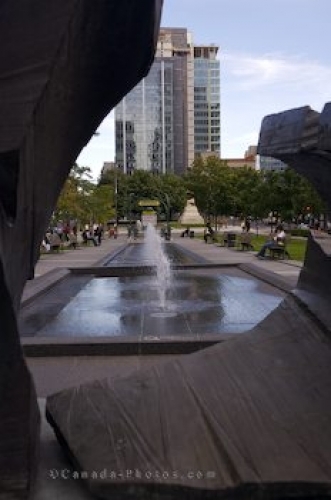 Picture of the fountain at Square Victoria in Montreal, Quebec as seen through a sculpture.